The Spinning Wheel Film Festival - the third installment of which was held recently in Toronto - showcases films for, by and about Sikhs. The round wheel of rural Punjab's charkha (spinning wheel) is replaced by a film spool in advertisements promoting the festival on national television. The festival holds a valuable place in the Sikh community's social calendar, and shows films and documentaries from India, the UK, the US, Australia, New Zealand and elsewhere that are otherwise not easily accessible to viewers. Festival Chair Mandeep Singh Rayat, an event manager by profession, says, "We grew up listening to stories with Sikh heroes, but did not see films that projected the true character and persona of Sikhs. This festival aims to do that and to encourage Sikh youth to develop an interest in this medium." Rayat, a second- generation Canadian, is fluent in both Punjabi and English. The stereotype of the 'sardarji' (colloquial reference to a Sikh gentleman) in mainstream Bollywood films - as either a confused simpleton providing comic relief, or worse, a temperamental person always ready for a quick fight - is one of the main reasons for establishing this festival. This is what led eminent Sikhs from different professions in Toronto to put their heads together and come up with an alternative film show. Eminent lawyer and Member, Festival Advisory Committee, T Sher Singh says, "It is time we began our own film industry, especially since the Indian Diaspora is the mainstay of the Bollywood industry, and the Sikh component of the Diaspora is one of its largest and most important segments. We think there is an acute need for this festival. Now, three years after starting it, the proof is indeed in the pudding. The phenomenal response to date shows that it is meeting a need and filling a vacuum." The festival has not shied away from sensitive topics. One of these is the 'appearance' of Sikhs. This is a matter close to the hearts of most practicing Sikhs who live in Western societies, and are questioned on their appearance - as members of a faith that encourages unshorn hair and wearing a turban. 16 - looked at the post-9/11 North America and the pressures that Sikhs have had to cope with to maintain their appearance, an intrinsic part of their identity. 'Dastaar: Defending the Sikh Identity', a 13-minute documentary directed by New York-based filmmaker Kevin Lee, effectively probed the role of media in presenting images in which Sikhs are easily mistaken for Al-Qaeda terrorists. 'Divided we Fall: Americans in the Aftermath' directed by Sharat Raju looked into the hate crimes against Sikhs after September 11, 2001. This documentary was inspired by the death of Balbir Singh Sodhi, who was the first of the eight people killed in US in the aftermath of September 11. 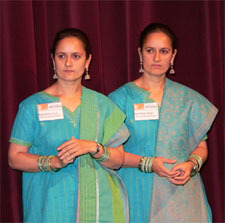 Films that look at the lives of Sikh women is another focus area. 'Amu' - the film that opened the festival - is the story of Kaju, a non-resident Indian (NRI) girl, who goes to India to find out more about her roots and discovers the dark secrets of the 1984 riots. According to director Shonali Sen, the social message in 'Amu' is that women who were widowed in 1984 deserve justice. Sen said, "I was a first year student in Delhi University when the riots occurred. Like most people around me, I participated in the rehabilitation work. But later I found that the 1984 widows were never given justice. They have been marginalized. Through my film, I support their struggle and ensure that the youth know their history and go into the future armed with it." Another theme that dominated the 2005 festival was that of brides from Punjab who are married to NRI grooms, who harass their families for dowry. Meera Dewan's documentary 'California Dreaming: India Brides Search for Ex-pat Grooms' concentrated on the Doaba region of Punjab and picked up stories of women from remote villages who have been duped by NRI husbands. The documentary looked at grooms from the US, Canada, Germany, UK and even Libya. It gave details of how stories of personal freedom in the West influence girls to marry abroad, and how they are duped by grooms who never file for their immigration. In his excellent documentary 'Runaway Grooms', director Ali Kazimi showed how families of two girls based in Delhi and Punjab are fighting cases against husbands in Canada who married them for a fat dowry. The festival has also been bringing Sikh women directors and producers to the mainstream. Valerie Kaur, producer of 'Divided We Fall', Amrit and Rabindra Kaur Singh, also known as the 'Singh twins', directors of 'Nineteen Eighty Four and the Via Delorosa Project' are some of the filmmakers whose work has been shown and encouraged in the festival. The Singh twins' documentary presents a personal perspective to the making and inspiration behind their painting (titled 'Nineteen Eighty Four') of the storming of the Golden Temple at Amritsar by Indian troops in 1984. Explains Sher Singh, "Gender equality is a fundamental pillar of Sikhism. Sure, many of our institutions and individuals fail miserably in actual practice. So what? It is time we built institutions that tackle the problem headlong. We at the Spinning Wheel are not afraid to be critical of our community, when it is justified. Social action is intrinsic to being a Sikh." Introductory notes to the festival explain how, in earlier times, villagers gathered around the charkha to spin and weave. This also doubled up as a meeting ground to share stories. The Spinning Wheel Festival is, similarly, a meeting ground for filmmakers and the audience to explore their life experiences through films. Pride in Sikhism is an intrinsic part of this festival. And often the festival has gone beyond films to show this. Festival 2005 showcased paintings by Navjeet Singh Chhina, who has made numerous portraits of Maharaja Ranjit Singh and Bhagat Singh. Said Chhina: "Through my paintings of Ranjit Singh, I have tried to capture the golden age of Sikhism." However, doesn't looking inward often lead to false pride and separation from mainstream Canada? Sher Singh explains why not: "The fact that we tell our stories cannot possibly mean that we have become parochial. If this principle were true, no religious group would be allowed to do anything unless they were working in conjunction with all other groups." He holds that Sikh-Canadians, who have a better understanding of their Sikh identity, invariably make better and stronger Canadian citizens. "In turn, Canadians who have a clear understanding of what it means to be a better Canadian, ultimately make better citizens of the world."